It’s been a few weeks since I’ve updated the Family of 4 Harvest records for you. To be honest, we’ve just been estimating for a couple weeks. This week I did actually weigh everything that we harvested. 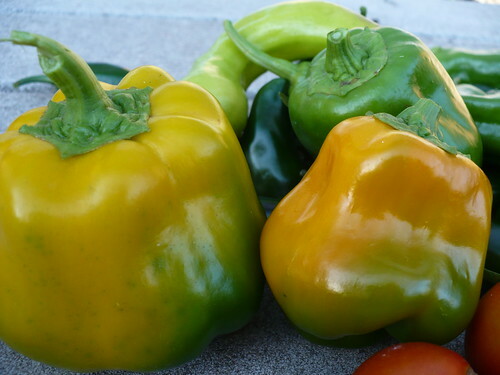 We had a bunch of peppers, including these two ‘Early Sunsation’ yellow bell peppers. They still aren’t as big as I’d like to see them, but you can’t complain when you’re getting yellow peppers! There were lots of jalapenos, and the ‘4th of July’ Tomato plant has really earned its place in the garden, producing 2 lbs of tomatoes all by itself! Posted on October 5, 2010, in Family of 4 Garden and tagged harvest, peppers. Bookmark the permalink. Leave a comment.